Princess Charlotte is here. She is grown and improved in looks, but I do not think her manner dignified, as a Princess’ ought to be, or indeed as I should wish a daughter of mine to behave. 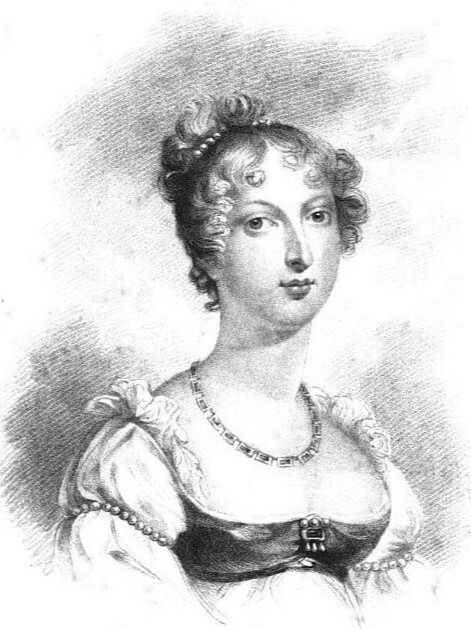 She hates her ‘Granny’ as she calls her [Queen Charlotte] loves nobody here except Princess Mary and Sophia, goes swaggering about, and she twangs hands with all the men, is in awe of no one, and glories in her independent way of thinking. Her passion is Horses that and mathematics are the only amusements she has. Her riding is beautiful – no fear of course-gallops and leaps over every ditch like a schoolboy – gave her groom a cut with her whip about the back to-day and told him he was always in the way. This was in good humour though, but it is not acting en Princesse. Frederick FitzClarence* is on a visit to Mrs. [Feilding?] She [Princess Charlotte] is very fond of him, and makes him ride with her every day, to the great annoyance of her Aunts as if the Granny knew it she would be much displeased, and I believe that is her chief reason for wishing it. Her Governess Lady de Clifford, she has not the smallest degree of respect for. I think her clever and she has a great deal of royal wit. *He was the son of Charlotte’s uncle, the future William IV, and his mistress Mrs Jordan.